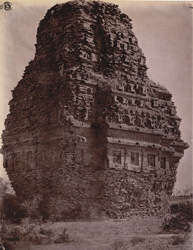 Photograph of the ruined temple at Bhitargaon, about 20 miles south of Kanpur, taken by Joseph David Beglar in 1878. This is a very important monument as it is probably the earliest surviving Gupta temple in terracotta. It has been dated to the 5th century. The temple is built on a square plan with double-recessed corners and is entered from the east. The sanctuary is covered by a tall pyramidal spire. The outer walls are decorated with terracotta panels framed by pilasters. Although damaged, some of the figures have been identified as Shiva and Parvati seated together (south) and an eight-armed Vishnu (west). There is a frieze of ornamental plaques decorated with aquatic monsters, miniature fighting figures and foliate panels above the first row of panels.